Great Lakes Computer: End of Support is Coming for Select Catalyst 4500 Switches! End of Support is Coming for Select Catalyst 4500 Switches! The end of support date for select Cisco Catalyst 4500 Non-E-Series Chassis, Supervisor Engines, and Line Cards is July 31st. For those currently leveraging this switching platform, this can be cause for concern -but it doesn’t have to be. If you wish to continue using these products, you can extend their life by purchasing spare parts and upgrades for your existing 4500 chassis. Or you may want to take this opportunity to evaluate new solutions for your network for future growth, performance, and reliability. With so many options and vendors to choose from, it can be a bit daunting. Below is some information on both comparable Cisco replacements for the Catalyst 4500 Non-E Series switches as well as comparable replacement options from both Juniper Networks and HP. 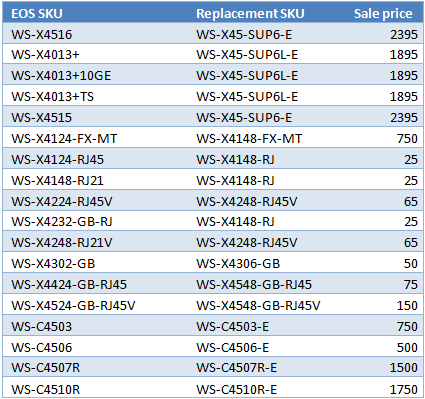 The table on the right lists all of the primary end of support SKUs and the Cisco replacements. Where is this Attack Coming From? !